Maddie's pedigree speaks for itself. Her sire is a buck I have always admired. 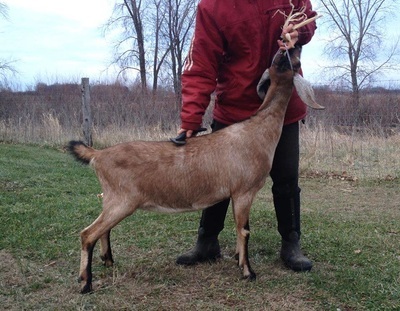 He throws so much consistency in his kids and can be found in most of the pedigrees of the top Nubians. Having King as Maddie's sire is particularly special because he passed away this winter, making Maddie one of the kids from his last live bred kid crop. 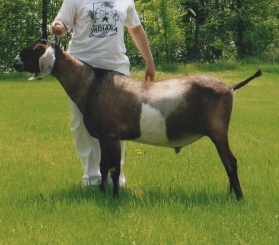 King was the 2008 ADGA Nat'l Premier Nubian Sire. His offspring include all of the fabulous kids from the King X Mystere cross (Misha, Moulin Rouge, Most Wanted, Mandalay Bay) as well as Blissberry She's So Fine, and Pella's Triple C Yahtzee. Maddie's dam, Jamaica, is a lovely doe I got the privilege of meeting in person! She is beautiful. She is a smaller Nubian, but a correct Nubian who has milked over 3,000 lbs each lactation. 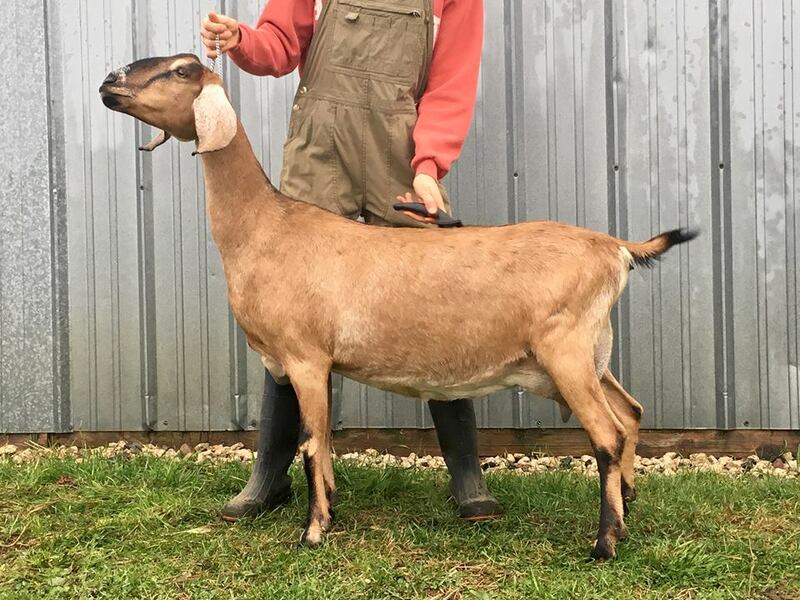 This King X Jamaica cross also makes Maddie 3/4 siblings to Blissberry Malibu Black (retained by BlissBerry) as well as Blissberry Jamaican Me Shine (owned by Caprine Divas and now back at Blissberry). With this pedigree, I can only expect great things! Maddie already shows a lot of promise. She stands on strong feet/legs and boasts the highest/widest escutcheon in the herd! 2016: Maddie freshened with B/D twins and a beautiful udder, high/wide escutcheon & fabulous fore udder. Unfortunately after separating her from her kids for 24 hrs at about a week old for monthly milk testing, she developed severe gangrene mastitis and lost half of her udder. She was on death's door and even though she will never be in full production, or earn her milk star, or be appraised, I am so grateful that she made it through this ordeal and will at the very least be able to reproduce, even with only half an udder. She will be given the next year off and will not be bred again until fall '17. Her body needs more time to recover. With everything she went through though, she still looks beautiful; long, very level doe. I suspect that having this next year off will help her gain more body capacity. 2017: Maddie was supposed to have the year off after her ordeal last year. By January/February though she was looking better than ever. She had a silent heat and managed to somehow get with one of the bucks. She kidded twins bucks in August and was successfully able to raise them on half an udder with a little bit of supplementing. One of her kids was 45# by a month and a half old! She has been bred to *B Blissberry LT Vegas Jackpot for 2018 kids. 2016: B/D Twins. Gangrene Mastitis, lost 1/2 udder. Retained Daughter LOSA ACRES WF MONTEGO.